Voortrekker pioneers explored the Lydenburg area since the 1800’s and in 1845 under the leadership of Andries Pretorious, some 300 Voortrekker families settled in Ohrigstad and established the first Volksraad. A large number succumbed to malaria and in 1849 the remaining trekkers relocated to a more temperate climate and established Lydenburg. In 1850 the town of Lydenburg was proclaimed and the postal service connects this area to other parts of Southern Africa. One of the first buildings in Lydenburg was the Voortrekker school that was opened in 1851. The Voortrekker church was completed in the 1890’s.During the Anglo-Boer war, the church was used by the British as a stable.The church is still in its original condition, including the cow dung floors. In 1873 alluvial gold was discovered in the area and the town experienced a typical ‘Gold Rush’ as the precious metal was sifted from the waters. Regrettably the supply soon dried up! Lydenburg Museum is a treasure-house of early settler displays and is well-worth a visit- situated just out of town on the Long Tom Pass Route. ANGLO-BOER WAR. 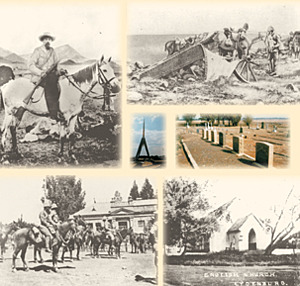 1899-1902 BATTLEFIELDS ESCARMENT TOURS- Relive the history of the epic battles waged in the area between Boer and Brit with an expert, Gerhard Delport. After a hearty breakfast at Stonecutters, the tour will visit Bergendal Monument, Maraiskop boer observation posts, British war Graves behind Suikerboschkop and at Ou Houtbossie. History will come alive whilst Gerhard recounts the various battles: victories and losses.In 1900, British solders occupied Dullstroom and the town was razed to the ground. The women and children were removed to a British concentration camp in Belfast.